10h00: My poor Bell had to go to the vet last night and again this morning. I hope she's feeling better! Have arrived in Spain and am currently sitting in a McCafe drinking lukewarm Chocolate Caliente (Hot Chocolate, I presume) out of a glass! The flight was okay. Horribly annoyed to discover that Iberia barely does in-flight entertainment. There was 1 TV screen in the middle which showed 2 movies at set times during the flight. No choices or options here. And I'd left my book & iPod behind because I thought I would hardly need them. No such luck. But with nothing much to do, I did get some sleep! The flight left just after 10pm yesterday evening. I slept and was woken for dinner at midnight over the middle of Angola. After that I slept as best I could till breakfast. We landed in Madrid at 7am (that's SA Time - 1hr) to 4 degreesC outside temperature and the sun had yet to emerge. Sadly I completely forgot to take a photo of "The Rain in Spain falling on a Plane" :) Not that it really would've been possible anyhow in the darkness. I was expecting an Airport Transfer but after half an hour of waiting, I made my own way to Hotel Laris. This involved a Metro trip with 3 changes and the help of a very kind little old man who spoke no English but escorted me to the hotel's street when he saw me staring, completely puzzled at the street map. I can only check in at 2pm so I'm off to see what's within walking distance. 12h15: Am back at the same McCafe - seemed like a safe spot to lunch. And I do so like to try the weird overseas additions to McDonald's staple menu. I had a McNific Meal with the CBO (Chicken, Bacon & Onion) Burger. Not particularly upset that we don't have it back home. Plus, it gives me a safe comfy seated spot to write all this - still have just over an hour and a half till I can check in. 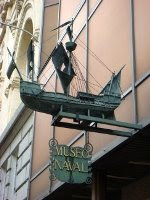 Before lunch I visited the Museo Naval de Madrid. Not the sort of place you might ordinarily find me, much as I love museums, I don't find boats / ships that interesting. But it was FREE. And I figure Spain is famous for it's Armada so it was probably worth a look. And it was very interesting ... aside from the fact that all the blurbs below each item were only in Spanish. The weaponry was interesting too, it's amazing how little guns have actually changed in all these years. But my favourite part was the room containing pieces recovered from the San Diego, which sank in 1600. 19h00: After lunch, I came back to the hotel and met a few of my fellow tour mates. This afternoon I intended to visit the Archaeological Museum, but it turned out I'd found the wrong museum on the map and walked all the way to the Anthropological Museum and found it closed before I realised my mistake. So off I headed in completely the opposite direction to the Archaeological Museum (quite a trek all the way up Plaza del Prado) only to find it was also closed. I'd left it till the afternoon because it's free after 14h30 on Saturdays (no sense on spending all my Euros on museums) but I was completely unaware that today is a public holiday, All Saints Day, and it had closed at 15h00. Sadly I won't even get to visit it during our 8 hour stop-over on the way home because that'll be a Sunday and it'll also be closed by 15h00. So annoying cause I was quite keen to see it. Note: Bell is back to normal apparently but managed to pull out both stitches. Luckily it sounds like she's healing fine tho! "Sadly I completely forgot to take a photo of "The Rain in Spain falling on a Plane" "